The 2014 matchup between the Anaheim Ducks and Los Angeles Kings at Dodger Stadium was an enchanting experience for everyone. According to NBC, the game was a rating success as well with a 2.38 share, the highest rated regular season game on NBCSN in LA. The next season’s game in Santa Clara was a success as well, when the San Jose Sharks hosted the Kings in front of a sold-out crowd of over 70,000 fans at Levi’s Stadium. That made it the third-highest attended game in league history. California needs another outdoor game. 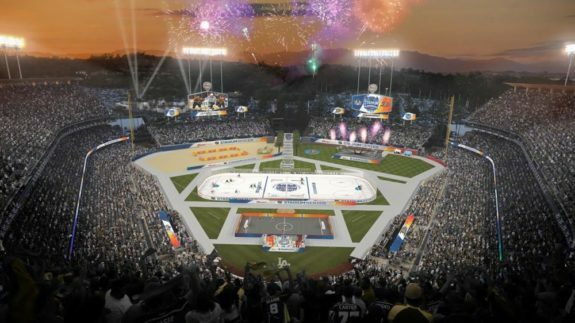 Here are some realistic ideas and some fantastical locales for the NHL’s next California outdoor game. The NHL confirmed on Jan. 1 that the 2020 Winter Classic will take place at the Cotton Bowl in Dallas with the Stars hosting an undecided team. It’s a smart play for the NHL to hold another game in a classic college football stadium in college football country. When it’s time to come back to California for an outdoor game this would be the smartest option: to host a game between the Ducks and Kings at the Los Angeles Memorial Coliseum would almost be too perfect. First, it’s not a baseball field. Move away from the baseball fields. Dodger Stadium has already hosted one, and while old baseball stadiums look great on TV, the in-person experience is underwhelming. Most of the sight-lines are miserable and there really aren’t any classic baseball parks left to visit. The Coliseum has the history part down. 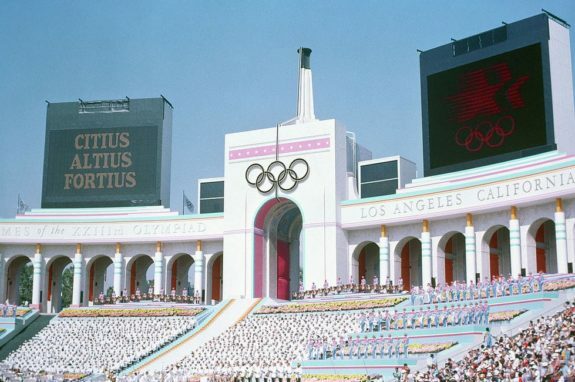 It’s hosted two Summer Olympics and will host a third in 2028 (you’re welcome for the cross-promotional ideas NBC.) It’s played home to countless legendary college football games, NFL games, MLB games including a World Series, concerts, you name it. The NHL can also help further its goal of bringing varsity college hockey to Southern California with an outdoor game at the Coliseum. The arena is affiliated with not one but two Pac-12 teams that could field successful Div. 1 NCAA hockey programs. 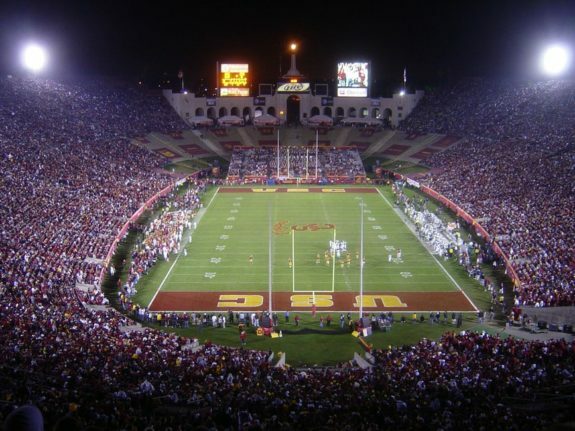 The USC Trojans are the Coliseum’s most famous and decorated tenant, but for close to 50 years it also hosted the UCLA Bruins until they moved to the Rose Bowl. What an excellent opportunity to host a college game between the USC and UCLA club hockey teams after the NHL game. The potential to showcase college hockey in Southern California and the media attention it would bring might help motivate either school to start a varsity program. It’s not unusual for college teams to skate on the NHL’s outdoor ice after their game. It’s happened in Boston and Chicago and will happen at Notre Dame on Jan. 5. However, they need to make sure to hold the game when USC is in session to attract as many students as possible. If you’re looking for TV eye candy, the Coliseum is perfect. It has pristine views of the Los Angeles skyline from its upper decks and the iconic Peristyle behind the east end zone. The NHL could include all three California teams much as it did at Yankee Stadium in 2014 when the New York Rangers hosted the New York Islanders and the New Jersey Devils in consecutive games. Like a teenager trying to distance themselves from their parents, the Anaheim Mighty Ducks ditched the “Mighty” in 2006 when Henry and Susan Samueli purchased the team from Disney. However, like many twenty-somethings, it’s time for the Ducks to come home and embrace their parents. Anaheim started this season with multiple throwback jerseys and events honoring the Ducks’ 25th anniversary. What better way to celebrate their 30th birthday in 2023-24 than to have the Ducks host an outdoor game at Disneyland? Yes, it’s about as fantastical as “The Little Mermaid” or “Fantasia,” but it’s not impossible. Disneyland has, in years past, hosted a public skating rink around the holidays. No, it wasn’t even close to standard NHL sized, and the Christmas tree in the middle may add a wrinkle to the game unlike any before, but at least they’ve seen ice before. They did make “Frozen” after all. It’s not just the “Mighty Ducks” movies where ice hockey and Disney intersect. Disney made “Miracle,” so why not host a game on Feb. 22, the anniversary of the Miracle on Ice. If you think an NHL game at Disneyland is outrageous, how about an NHL game on the beach. How many times have NHL broadcasts associated Southern California teams with beaches and palm trees? Well, it’s time to walk the walk or maybe skate the pier. How cool would it be for the Ducks and Kings to play a game on the beach? The classic image of children skating on a pond surrounded by snow-dusted pine trees is what almost everyone thinks of when you hear “pond hockey.” Imagine an outdoor game flanked by palm trees and crashing waves. It sounds ridiculous, but is it really? California beach cities like Manhattan Beach (home to many Kings players) and Huntington Beach (the closest beach to the Honda Center) are more than big enough to fit an 85-foot wide NHL playing surface. If there isn’t enough space for bleachers on both sides, why not keep one side completely free of seating so there’s an unobstructed view to the ocean behind the players. Both beaches already host a major athletic event. 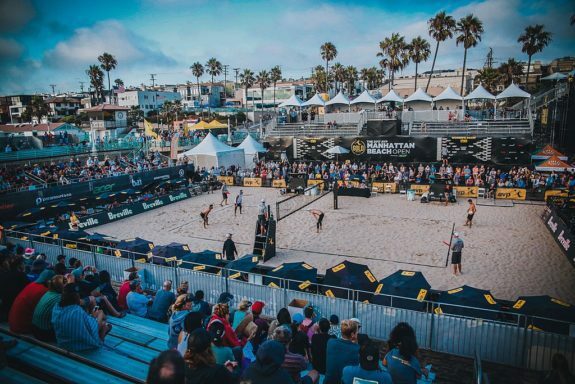 The Manhattan Beach Open is the Association of Volleyball Professionals’ (AVP) marquee tournament and they build a stadium to host the main event every summer. Huntington Beach hosts the U.S. Open of Surfing. Yes, the competitors are in the ocean, but it also holds stadium seating for fans. The temperature issue isn’t that big a deal. The daytime temperature for the Dodger Stadium game in 2014 reached 77 degrees Fahrenheit (25 Celsius). The game-time temperature was 63 Fahrenheit (17 Celsius). Air temperatures near the ocean are more consistent than inland, which would make producing artificial ice slightly more predictable, at least when it comes to freezing it.